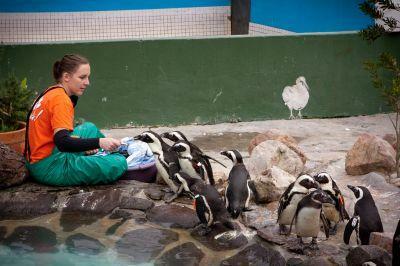 To celebrate World Penguin Day, Projects Abroad continued to support SANCCOB in Cape Town. SANCCOB is at the forefront of saving African penguins, as well as other seabirds. Volunteers assist in preparing food, feeding the birds, cleaning out the cages and rehabilitating injured or oiled birds. If the birds are unable to go back into their natural habitat, SANCCOB provides them with a permanent home. SANCCOB is also a leader in seabird disease research. Other than providing SANCCOB with dedicated volunteers, in 2013 our Animal Care Project in South Africa adopted an abandoned penguin who nursed by SANCCOB until his release on Boulders Beach in Cape Town. Sadly in 2010, African penguins went from the vulnerable list to the endangered list with only 21 000 African penguin breeding pairs left in the wild. Even though these are discouraging statistics, you could do your part by becoming a member of SANCCOB, adopting a penguin or giving a donation. Not everyone is able to help and rescue penguins on the ground, but there are little things that everyone can do that, added up, will make a huge difference to the lives of not only penguins, but a number of species.